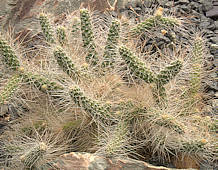 This sub-family includes over 300 species of cacti with the common characteristic of irritating barbed hairs (glochids) as well as ordinary spines. The seeds are hardened with a stone-like aril. Leaves where present are vestigial and short lived. 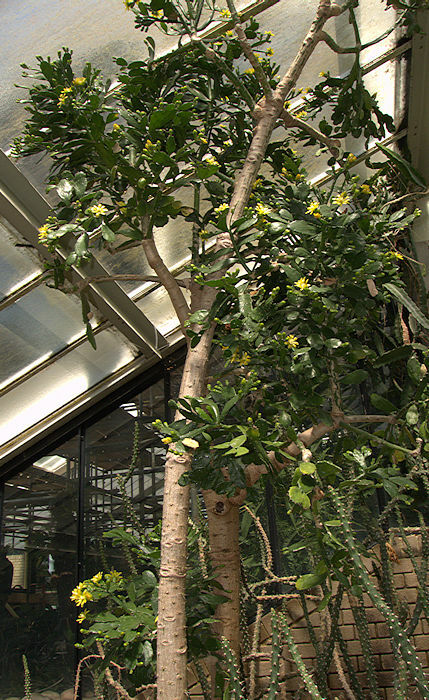 Members of this subfamily range in size from mat-forming plants to shrubs and trees. Native to a very wide range from central Canada to Patagonia in South America and naturalised in many warm climates where they may be regarded as invasive. 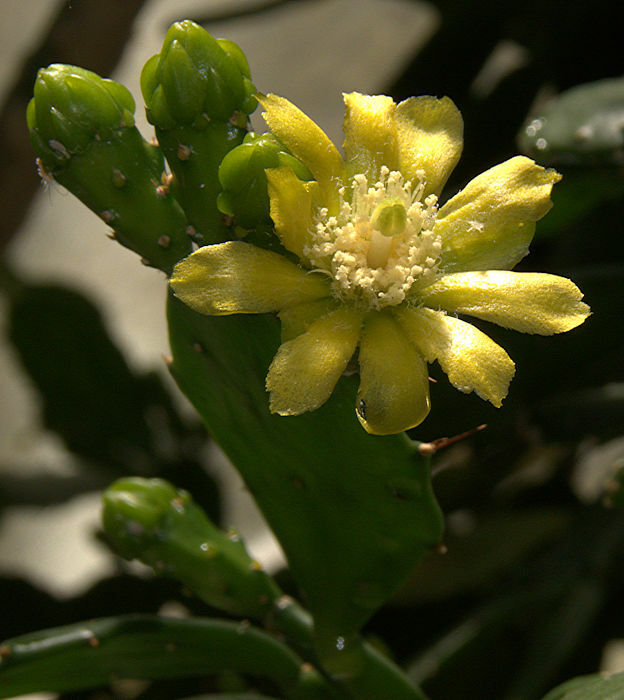 A monotypic genus for the South-American succulent tree-like cactus Brasiliopuntia brasiliensis. A stout trunk growing up to 60 ft tall and patterned with areoles, supports rounded branching stems bearing flattened dark green cladodes. Areoles are furnished with glochids and 0 - 3 spines. The flowers are golden yellow and are followed by rounded spiny fruit containing up to 5 large seeds. Native to Brazil, Paraguay, Eastern Bolivia, Peru and Northern Argentina and naturalised in other countries with tropical climates. The pulp inside the fruit is edible. Named for: Michelangelo Console (1812 - 1897) Italian botanist at the Palermo Botanical Garden. 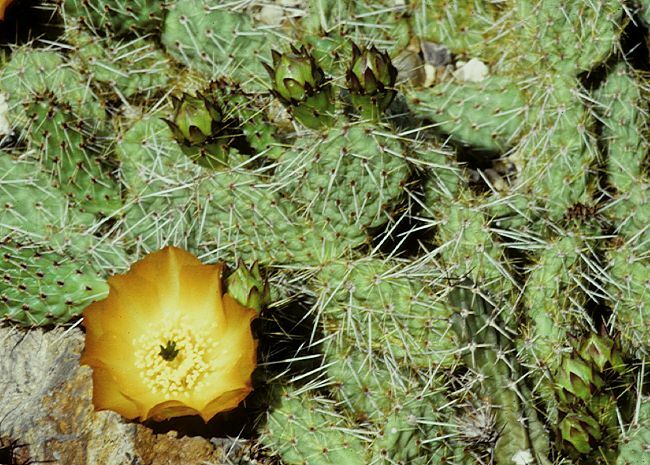 The genus includes 9 - 10 species of succulent tree-like cacti with rounded trunks and a crown of long flattened cladodes which have areoles with glochids and may or may not be spiny. The small flowers are yellow, orange or red. Native to the Caribbean and Florida. They are vigorous growers and consequently used in dry landscaping. Chromosome analysis has shown that seven species are hexaploid (2n = 66) and two species octoploid (2n = 88). Name: Latin falcatus = sickle-shaped, referring to the shape of the stems. This shrubby 8ft tall tree has flat shiny dark green cladodes up to 14 in long and furnished with spines. The small flowers are yellow fading to orange. Native to Haiti and the Dominican Republic where it is considered endangered with a single population of only 10 - 12 individual remaining. Noteworthy for posessing 88 chromosomes (octoploid). 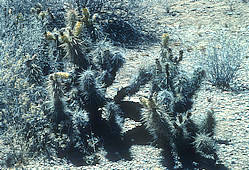 Many species that were in the genus Grusonia are now considered to be Corynopuntia. The genus Grusonia is currently monotypic for G. bradtiana. Corynopuntia includes 16 species of Opuntiads with ovoid tuberculate segments, forming spiny cushions 2 - 10 in tall. The spines are strong with toothed margins and an epidermal sheath at the apex. Flowers are mostly yellow or pink to magenta in a few species. Fruits are fleshy when green but become dry and brownish, are covered in glochids and full of flattened yellowish seeds. 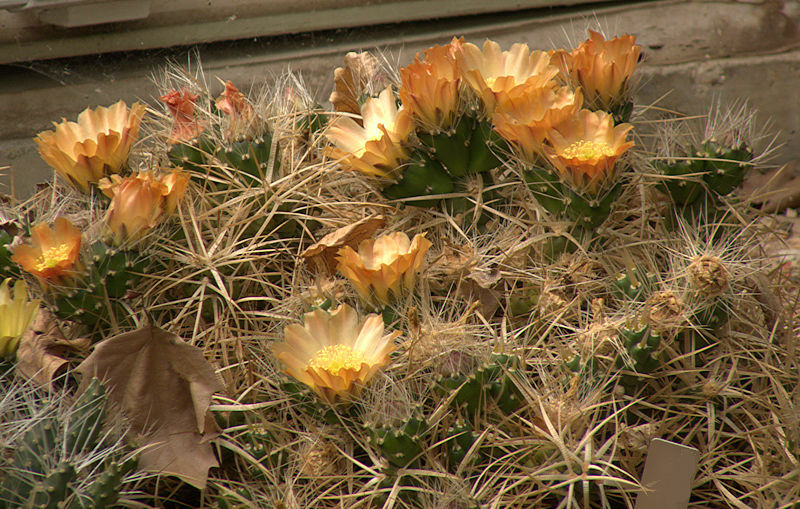 Native to the South-Western USA and Northern Mexico, generally growing in very dry areas at moderate elevations. Stem segments detach readily and can be transported for considerable distances stuck to fur or skin of animals by the toothed spines, rooting where they fall off. Name: Latin invicta = "unconquered"
This species has jointed, dark green stems formed from obovoid segments up to 5 in long, furnished with formidable spines which are bright red at first, fading to a pinkish-grey. 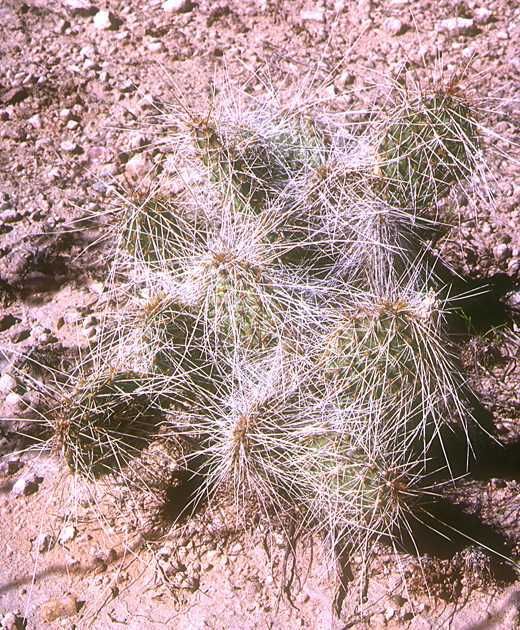 The tubercles have large wooly areoles with a few white glochids, 6 - 10 radial spines and 10- 12 stout central spines. The stems eventually form a spiny mat 6 ft or more in diameter. Flowers are yellow. 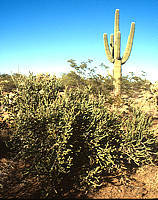 Native to the Vizcaíno Desert of Central Baja California, Mexico. Named for: Lord Edward Smith-Stanley, 13th Earl of Derby (1775 - 1851) art collector & naturalist. 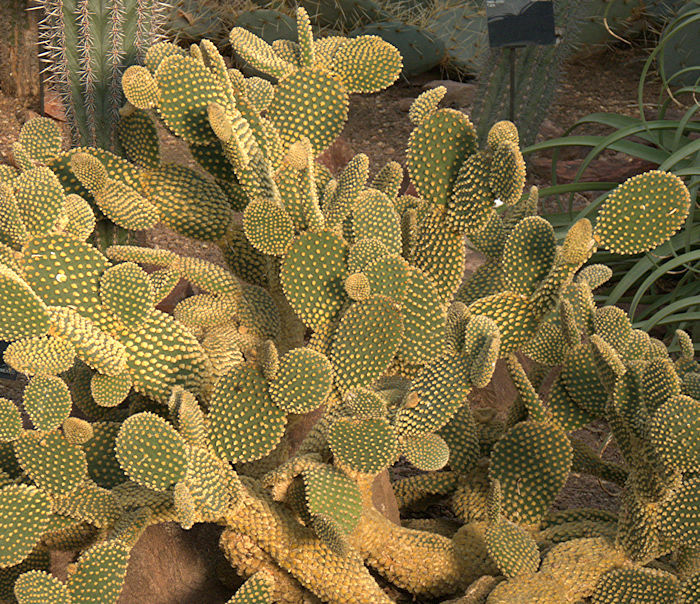 Richard Ernest Kunze (1838 - 1919) German physician, studied pharmacology of cacti. The erect clavate stems are furnished with areoles bearing 17 - 27 stout flattened spines whose tips are sheaved. 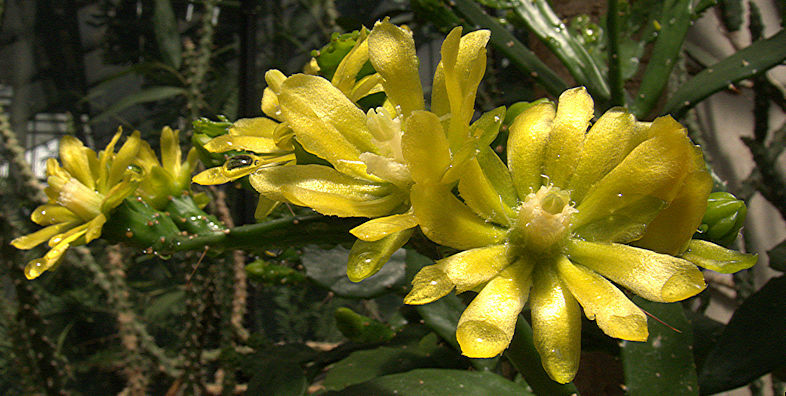 Flowers are yellow and are followed by yellow fruits containing flattened brown seeds. 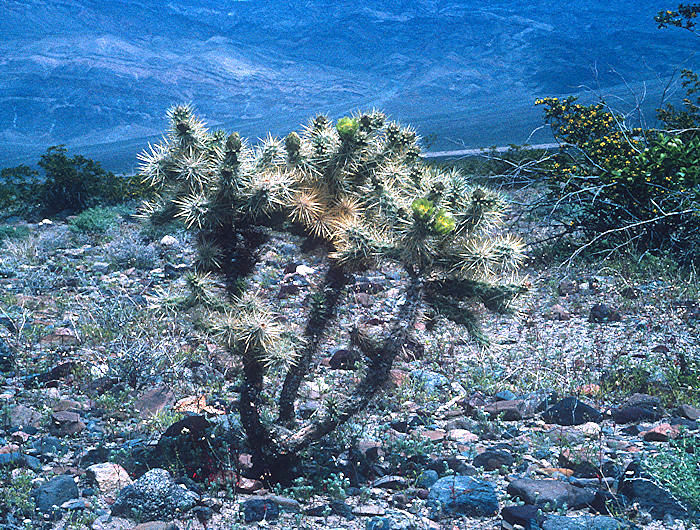 This low-growing Cholla tolerates salty ground on which little else will grow except creosote bushes. 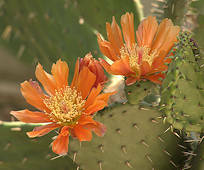 Native to California and Arizona, Baja California and Sonora, Mexico where it widespread. Photos: Puerto Blanco Drive, Organ Pipe National Monument. 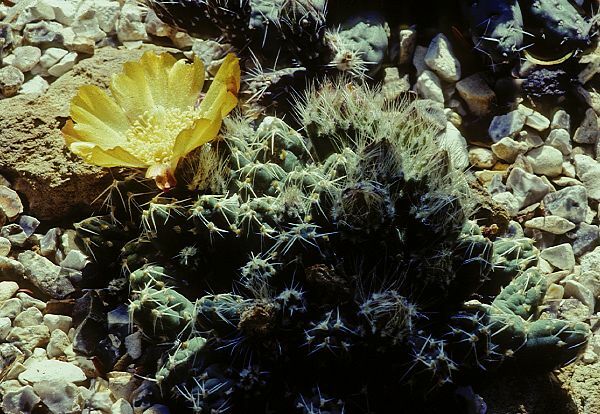 The 35 species of cacti in Cylindropuntia were formerly included in Opuntia but were separated on the basis of cylindrical stem segents and papery sheaths on their barbed spines. 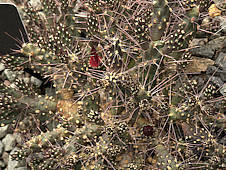 Cylindropuntia species range from small sub-shrubs to large trees. The stems of some species have a characteristic woven or rope-like appearance. 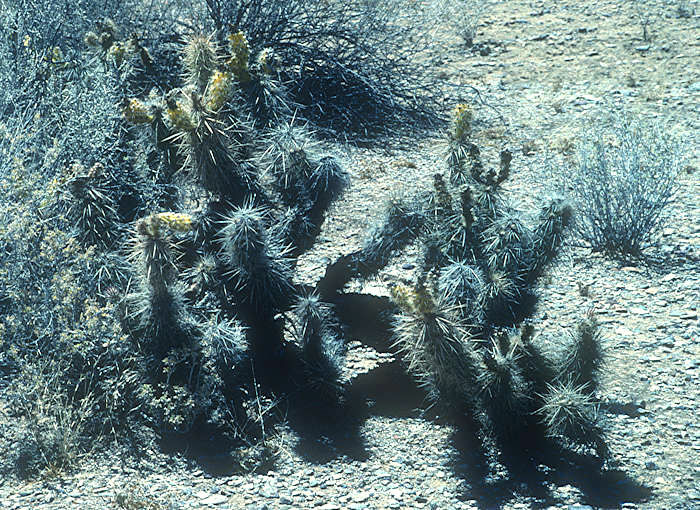 Chollas are native to the South-Western USA, Northern Mexico and the West Indies. 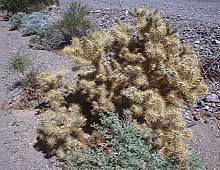 Large stands of genetically homogenous chollas occur in some places, where plants propagate vegetatively from dehiscent stem segments. A shrubby Cholla occasionally growing 9ft tall, but usually much less. 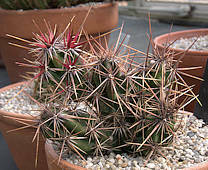 The rounded to angular succulent stems have widely spaced areoles with just one or two long yellowish spines per areole. The small flowers are greenish-yellow to orange-yellow and are followed by green club-shaped fruits. This cactus is hexaploid (2n=66). 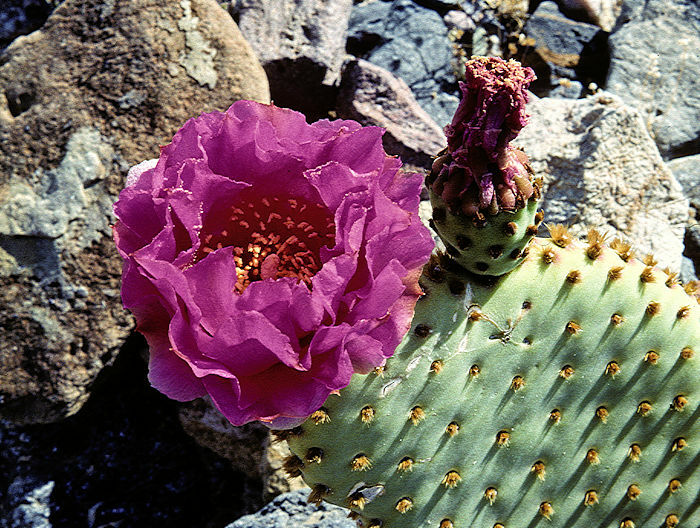 Native to the Sonoran Desert from central Arizona into Sonora, Mexico. 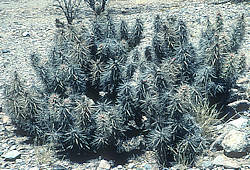 Photo: A forest of Cylindropuntia bigelovii. 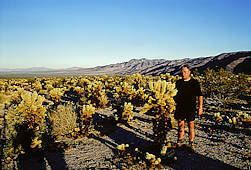 Cactus garden, Joshua Tree Park, California. Photos: Death Valley National Park, Ca. 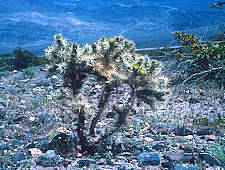 This large Cholla grows up to 7ft tall and may spread as wide. 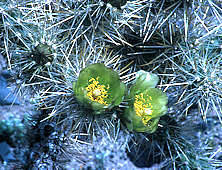 The stem is formed from cylindrical green segments covered with fleshy tubercles which each bear up to 20 long spines. Spination varies in colour from silver to golden. 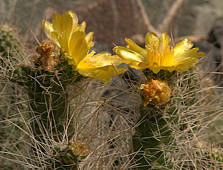 Flowers are greenish yellow to brownish or pink and are followed by spiny inedible fruit with white seeds. 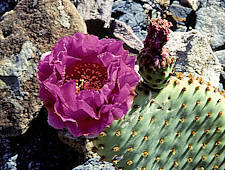 Native to dry deserts of Arizona, California, Nevada, Utah and North-Western Mexico including the Sonoran, Mojave and Colorado Deserts. 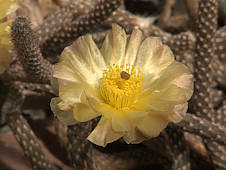 Green-flowered Opuntia wigginsii may be a natural hybrid between Cylindropuntia ramosissima (Pencil Cholla) and C. echinocarpa. 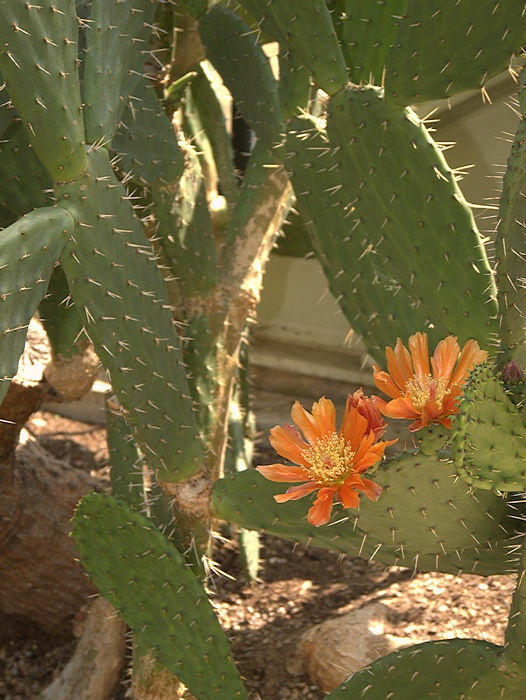 This shrubby cactus can grow 6ft tall, but more usually less. 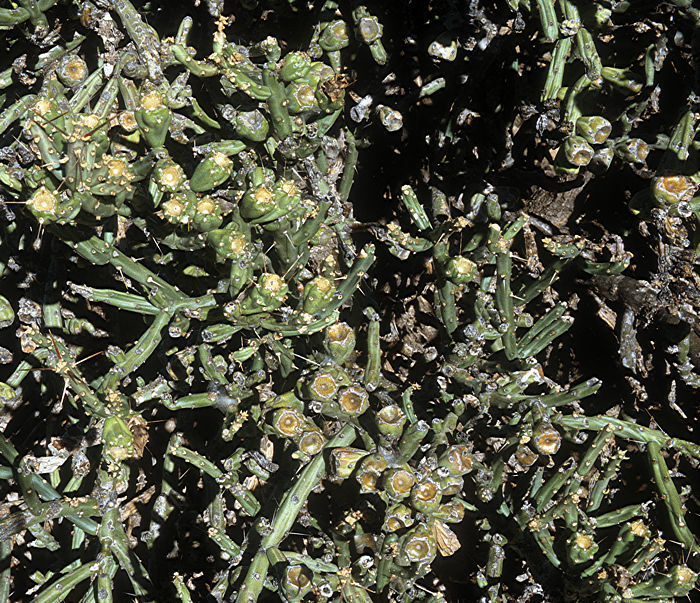 The narrow cylindrical grey-green stems are patterned with flattened diamond-shaped tubercles. Most tubercles have minute barbed glochids and no spines, but every so often there is an occasional single long straight spine. The small flowers are orange to brownish. 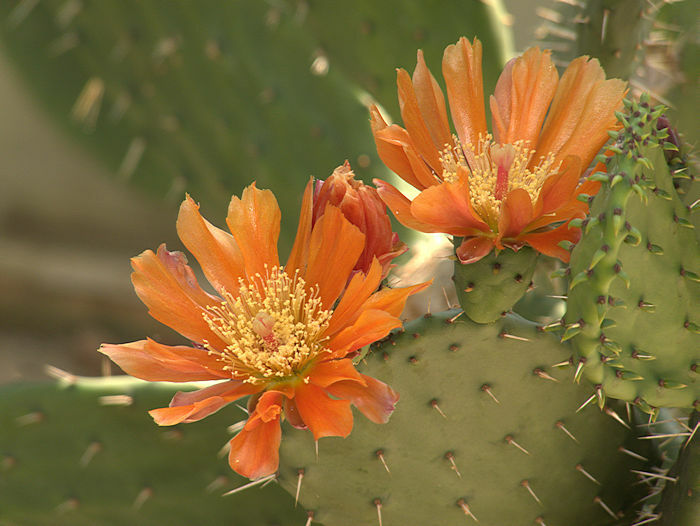 Native to a wide range across the Mojave and Sonoran deserts of California, Arizona, Nevada, Northwestern Mexico, Baja California and Islas San Benito. Photo: a small specimen only just surviving on stony ground 20 miles North of Las Vegas. 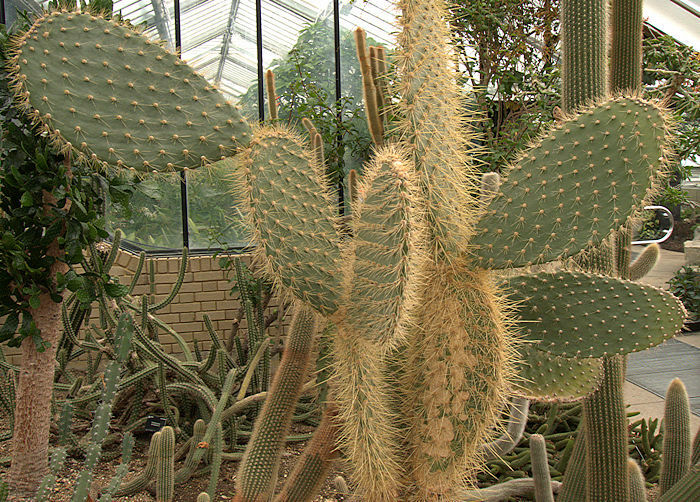 This cactus makes a sturdy 4 - 5 ft spiny shrub with many cylindrical branches covered in oval tuberculate projections. Areoles produce 7 to 14 spines with one long 2 in spine in each group. 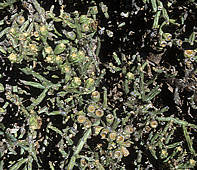 Green flowers are produced at the ends of the branches in the Spring, followed by cylindrical yellowish green fruits with tubercles but no spines. 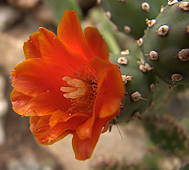 Native to Arizona, Colorado, New Mexico and Utah. Grows in impenetrable thickets. Photo: seedling at RBG Kew. 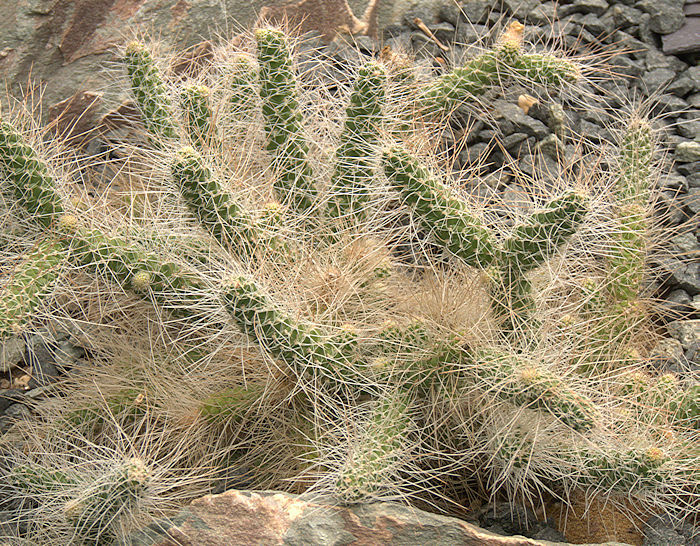 The genus Maihueniopsis contains 18 - 19 species of cactus, unrelated to Maihuenia. Several species have tuberous roots or taproots. They form low cushions of segmented rounded stems with vestigial leaves that are soon lost. 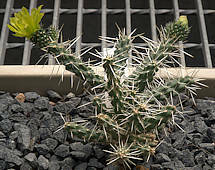 The spination varies from long and lethally sharp to tiny spines held tightly against the plant body. The flowers are mostly shades of yellow, but also red and white. Native to a wide range across Peru, Chile, Argentina and Bolivia, often at high elevations of 13,000 ft above sea level where frost and snow are experienced together with strong light and ultraviolet. The genus Puna has been merged into Maihueniopsis. This plant forms dense cushions of segmented ovoid stems with areoles producing 0 - 7 spines. Flowers are yellow followed by spineless ovoid green fruits. Native to Bolivia and Peru at high altitudes around 12,000 ft above sea level. In cultivation this species likes cool growing conditions. 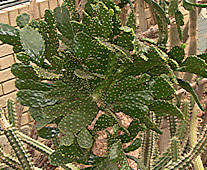 Photo: Holly Gate Cactus Nursery reference collection. 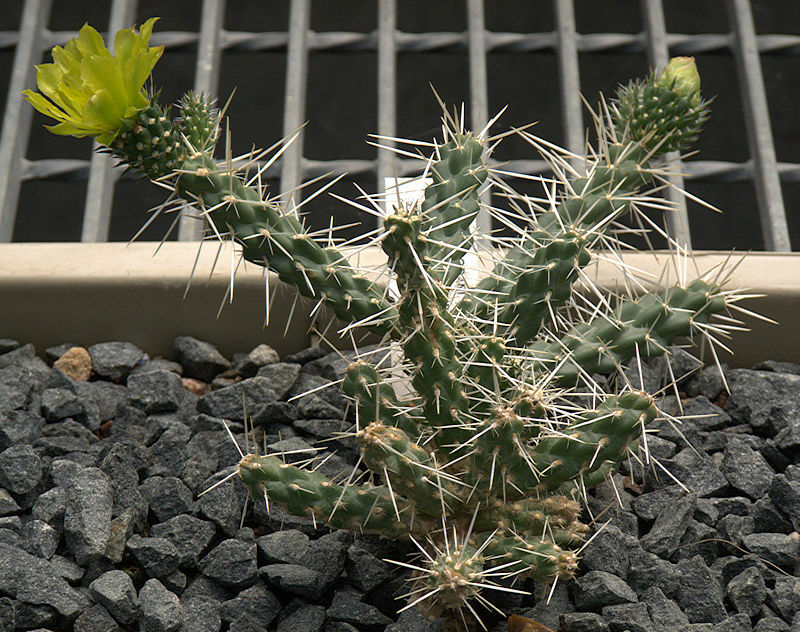 Named for: Charles Darwin (1809 - 1882) author of "On the Origin of Species"
This mat-forming cactus has olive-green cladodes with large areoles bearing stiff, lethally-sharp spines with a raised central rib and flattened margins. Flowers are orange-yellow followed by fleshy fruit of similar appearance to the cladodes. Roots are tuberous and sensitive to over-watering. Native to Argentina and Chile. Tolerates light frost and snow in its habitat. 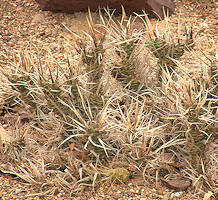 This mat-forming cactus has small, branching, ovoid to conical stem segments up to an inch long. 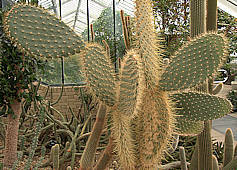 Areoles are sunk into the stem and produce glochids and a few spines recurved against the plant body, or spines may be absent. The relatively large flowers are yellow and followed by fleshy fruits. 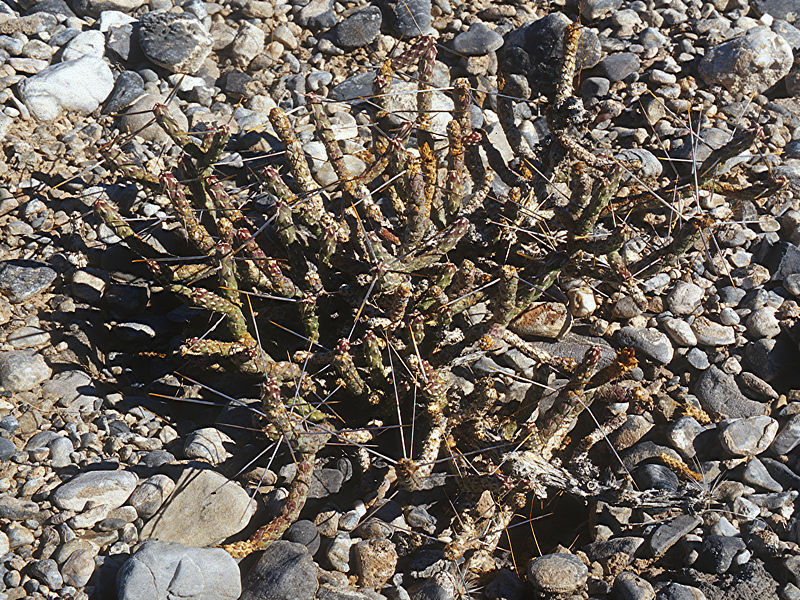 This low, shrubby cactus has branching ovoid to cylindrical purplish-green stem segments, with wooly areoles bearing 3 - 5 long spines on newer growth. The black spines fade to gray as the cladode matures. Flowers and fruit are red. Native to Argentina and Bolivia, growing at altitudes of up to 12,500 ft above sea level. Named for: Opus "a town of Locris in Greece". Theophrastus (371-287 BC) mentioned an edible plant growing there that was propagated by leaf cuttings. However, this could not have been an Opuntia as the genus originates from the Americas, unknown in that era. 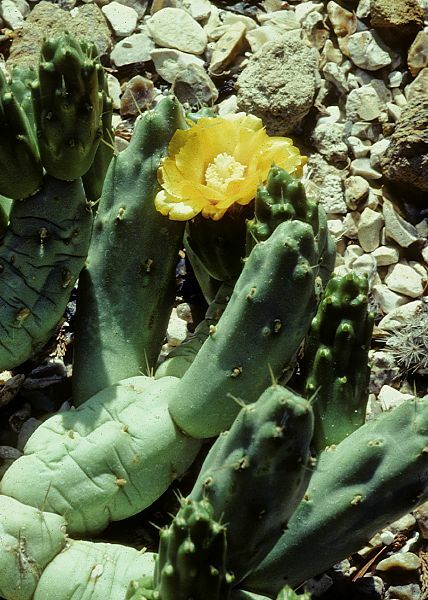 The genus Opuntia is a large group of cacti with flattened paddle-shaped stem segments (cladodes) furnished with two sorts of spines: large fixed spines and small, hairlike spines (glochids) that easily detach from the plant and penetrate the skin causing irritation. Native to a wide range of the Americas from British Columbia and Canada to Patagonia, South America, the West Indies and the Galapagos Islands. 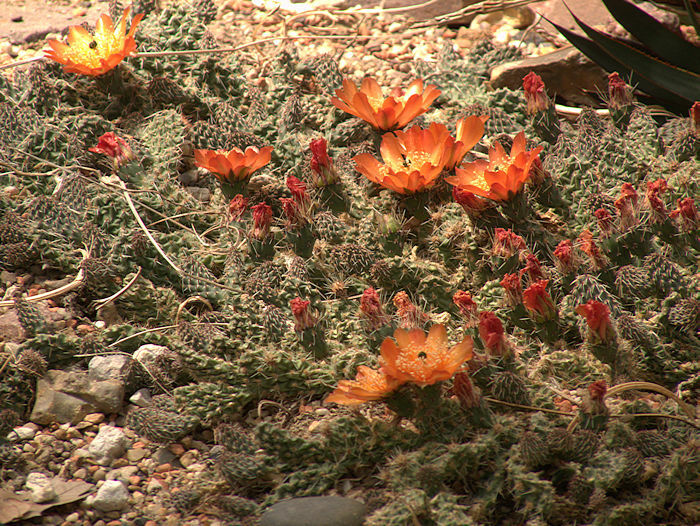 Opuntias have been introduced to many countries with mild climates and are considered invasive in some. 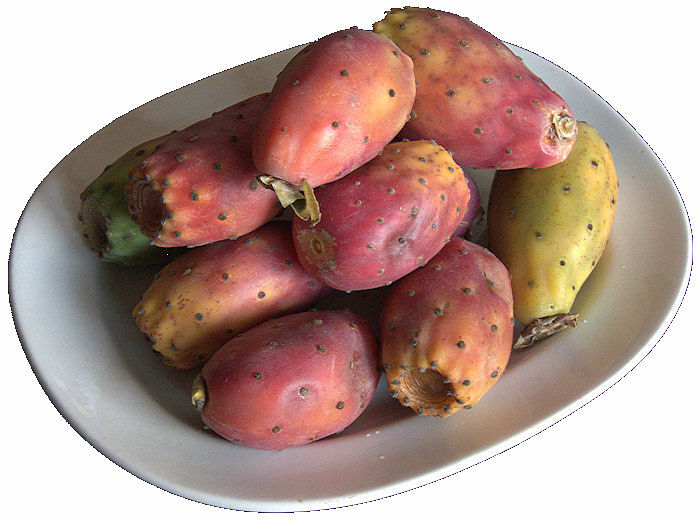 Some species of Opuntia are cultivated for their fruit which tends to be full of large hard seeds. 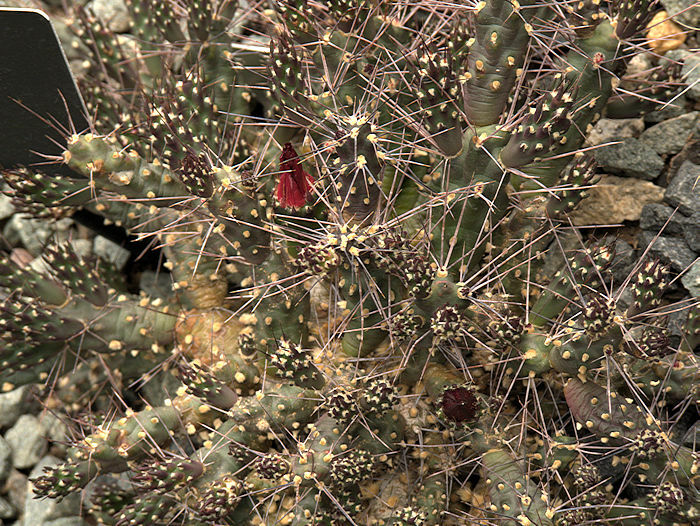 This is a low-growing (2 ft) cactus with gray-green to purplish pads that can wrinkle in drought. The areoles have white or brown wool and brown glochids with occasional spines on new pads. Flowers are bright pink. 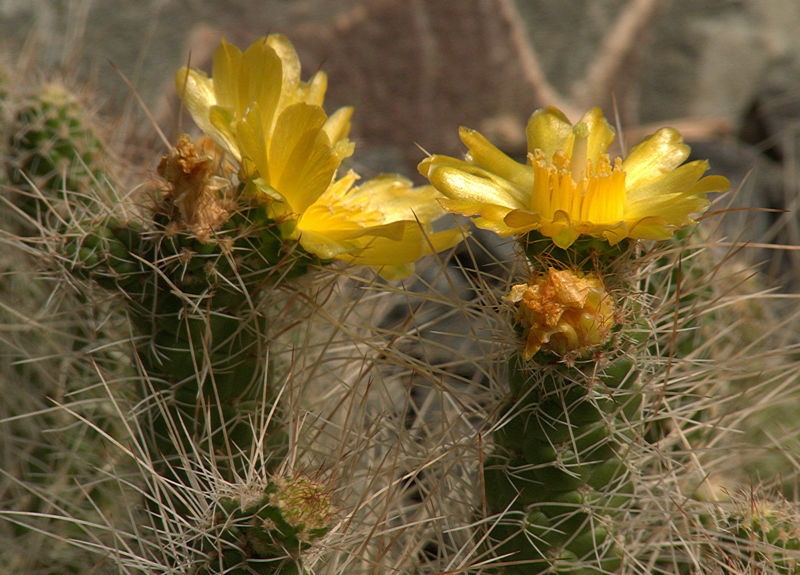 Native to Arizona, California and Nevada and into North-Western Mexico, growing at up to 3000 ft above sea level. barringtonensis - from Barrington Island, named after Admiral Samuel Barrington. 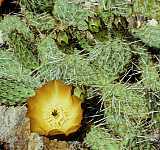 This tree-sized Opuntia grows up to 30ft tall with large 10 - 18 inch long ovate stem segments patterned with a regular array of areoles. There are few glochids but areoles have 2 - 20 yellow-brown spines. The large (5 in) flowers are yellow and followed by green to grownish fruit. Mature specimens have an orange-brown main stem with flaking bark. Native to the Galápagos Islands with five quite dissimilar varieties differently distributed across the islands. The large-growing variety shown is endemic to Santa Fe (Barrington Island). Opuntia echios var echios is more shrubby. Photo: near Salt Flats, Texas. 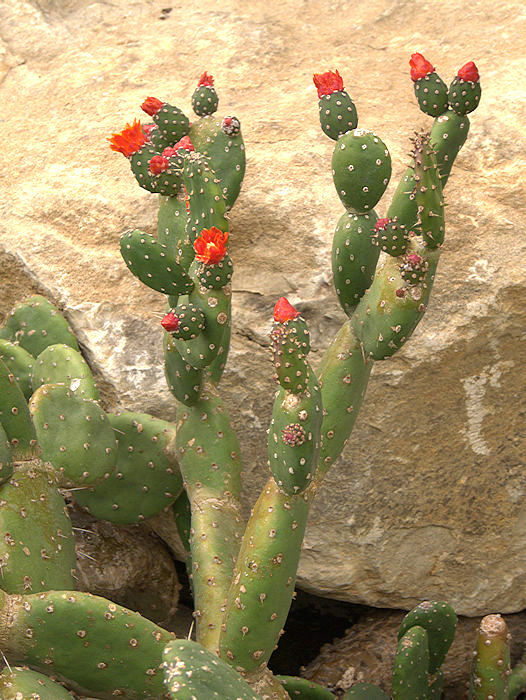 This shrubby Opuntia has eliptical stem sections with areoles furnished with glochids and 1 - 3 small spines. Flowers are yellow to orange followed by reddish, spiny, conical, edible fruit. Widely distributed in the Mexican states of Aguascalientes, Chiapas, Guanajuato, Guerrero, Hidalgo, Jalisco, México Distrito Federal, México State, Michoacán, Nuevo León, Oaxaca, Puebla, Querétaro, San Luis Potosí, Tamaulipas, Tlaxcala and Zacatecas, where it is used as food for animals and people. 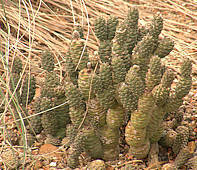 This shrubby cactus grows up to 2 ft tall with stems formed from flattened pads joined end to end. The pads have dense tufts of white or yellow glochids but no spines. 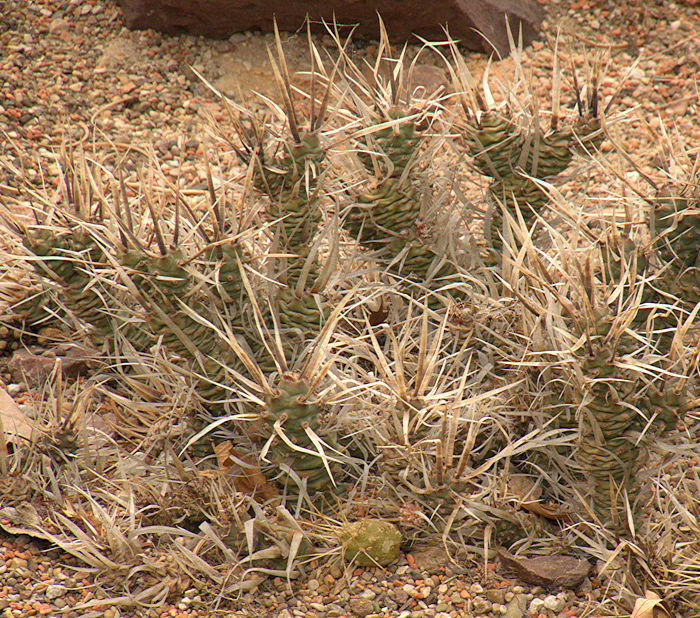 These glochids are barbed and detatch into one's skin with the slightest touch, causing irritation until removed. Flowers are yellow. Native to central and Northern Mexico. Despite the irritating glochids, this species is common in cultivation and there are numerous selected forms. Opuntia rufida from Northen Mexico into Texas, is very similar but has rusty-brown glochids. 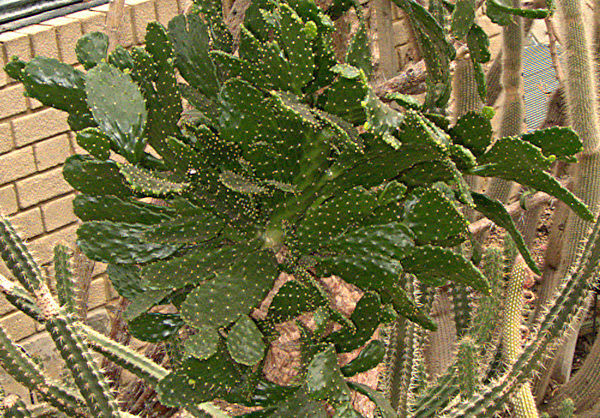 This shrubby cactus grows to 5 ft tall with both prostrate and upright branches. Areoles produce glochids, a few weak or strong gray spines or no spines and on new growth, stubby vestigial leaves which are soon lost. The orange flowers are dioecious, usually one at the end of each stem. Stamens in the female flowers do not produce pollen. Native to Ecuador and Peru growing at low elevations in valleys and plains. Name: Greek pteron = wing, referring to the winged seeds. 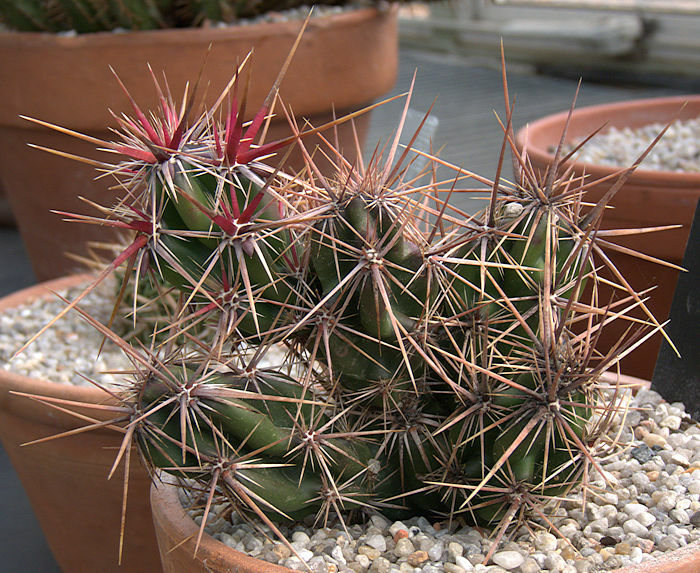 The genus Pterocactus includes 9 species with spheroidal to elongated stem segments bearing areoles with glochids but few or minimal spines except in a few species. 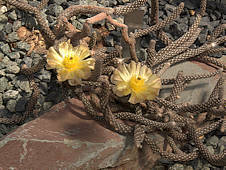 A single flower is produced from the end of new stems, followed by dry dehiscent fruit containing broad, papery winged seeds. Roots are tuberous and allow the plant to survive loss of its stems during Winter. Native to the Patagonia region of Argentina. Name: Latin tuber = truffle, referring to the thick roots. Named for: Dr. Carl Ernst Otto Kuntze (1843 - 1907) German botanist. This geophyte develops a huge tuber supporting thin, cylindrical, brownish-purple stems that break off easily, especially during Winter. 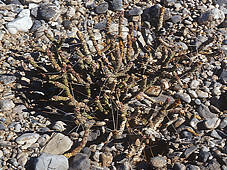 The dehiscent stems blow in the wind and may root to form a new plant. The tuber produces new stems in the Spring. Pale yellow flowers are produced at the ends of new stems. Native to Northern Argentina and Patagonia, growing in sandy soils with most of the tuber buried. In cultivation, the mature tuber may be raised above the soil for display but will not then grow any larger. 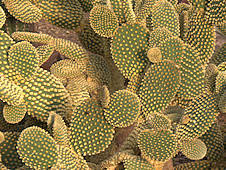 As with many tuberous plants, this cactus is quite sensitive to overwatering and should be kept dry during the Winter. Name: from Quiabento a Brazillian native name for the plant. 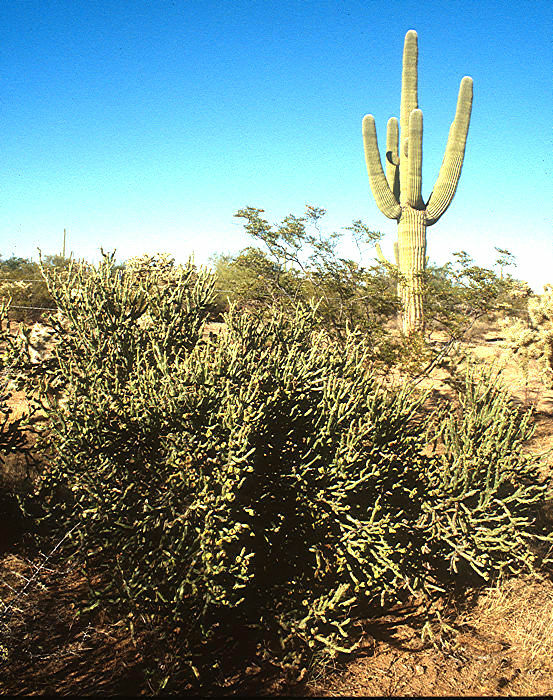 The genus Quiabentia includes two species of tree-like cactus with a spiny trunk growing up to 50ft tall, branching to form a leafy crown above the reach of herbivores. Quiabentia is related to Pereskiopsis and has glochids in its areoles. The persistent, flattened fleshy leaves are unique to this genus of Opuntiads. Pink to red flowers with spiny floral tubes arise from the stem tips. Flowers are followed by rounded fleshy edible fruit with large rounded seeds. Quiabentia verticillata is native to Argentina, Bolivia, and Paraguay. Quiabentia zehntneri is native to tropical dry forests of Bahia, Brazil. Uncommon in cultivation. Name: Latin verticillatus = whorled, referring to branches arranged in whorls. 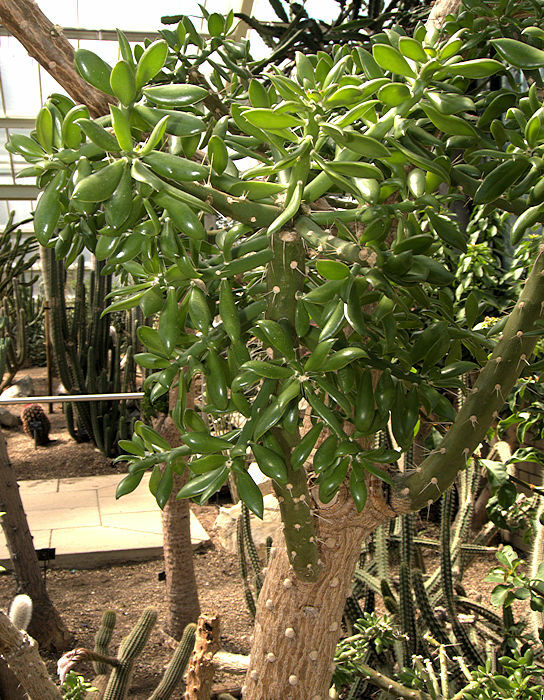 This tree-like cactus grows up to 50ft tall with spiny trunk and stems furnished with large, flattened oval to lanceolate succulent leaves. Flowers are pink to red followed by rounded fruit containing large, oblong seeds with a white aril. Native to Argentina, Bolivia and Paraguay. 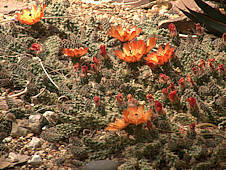 The genus Tephrocactus includes 5 species of small Opuntiads, with many synonyms. 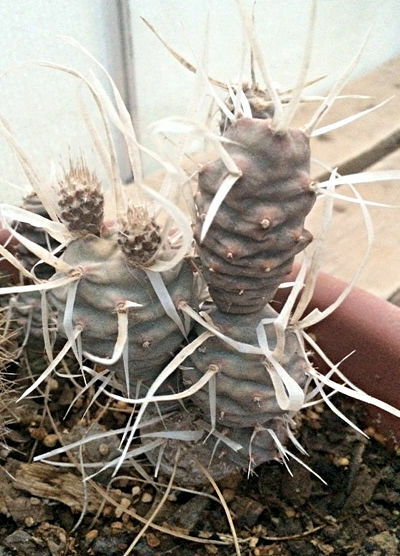 The stems grow in distinctive rounded segments bearing areoles whose glochids are sunk into them and spines which may be long and sharp or papery or more or less absent. Flowers are usually white to pink, or yellow. 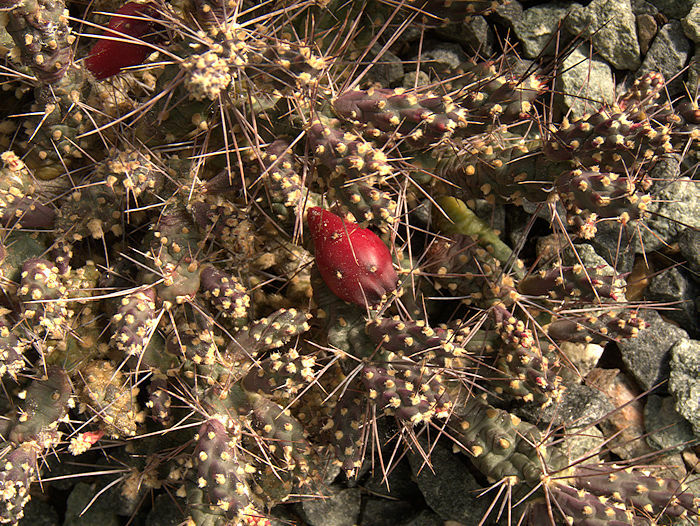 Tephrocactus rossianus has red flowers. Native to high elevations in the Argentinan Andes where they experience freezing conditions. The gray-green plant body is essentially spineless. Flowers are white. A form of T. articulatus with a well-jointed grey-green body offset by white papery spines with glochids at their base. Named for: Professor Georg Heinrich Weber (1752 - 1828) German doctor and botanist at the University of Kiel. 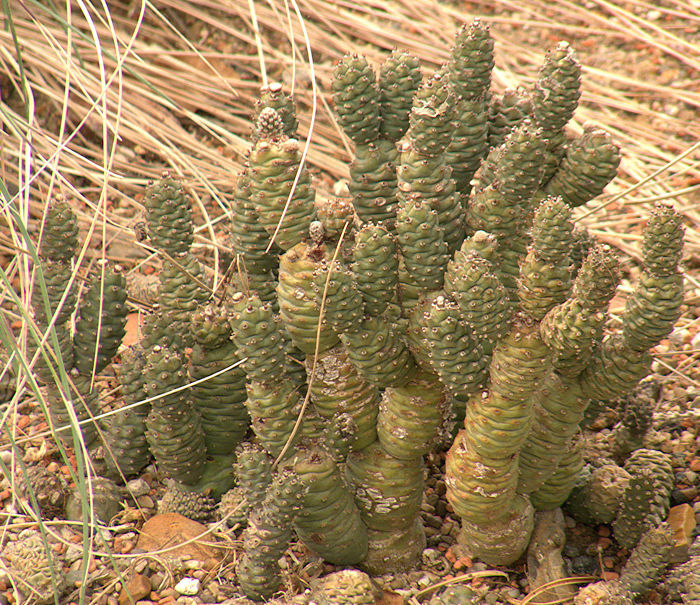 This small shrubby cactus has branching, spiny cylindrical stems that form large cushions up to 8 in in height. Stem segments detach easily. The areoles have glochids and 3 - 10 long, flexible white to brown or black spines. Flowers are lemon to orange. Native to central and Northern Argentina. 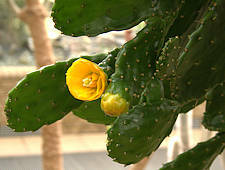 Name: Tunilla = small tuna, a common Spanish word for Opuntia pads. 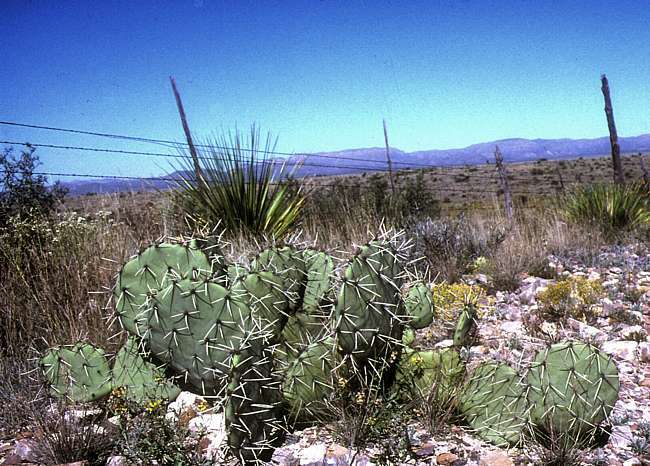 The genus Tunilla includes 9 species of low-growing, mat-forming cacti with flat, jointed cladodes or rounded stem segments. 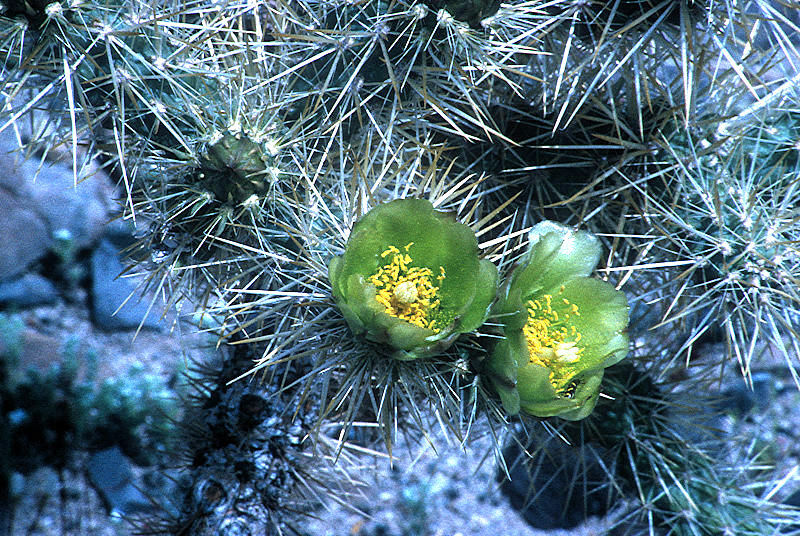 The areoles produce both glochids and needle-like spines. Flowers are yellow to red. 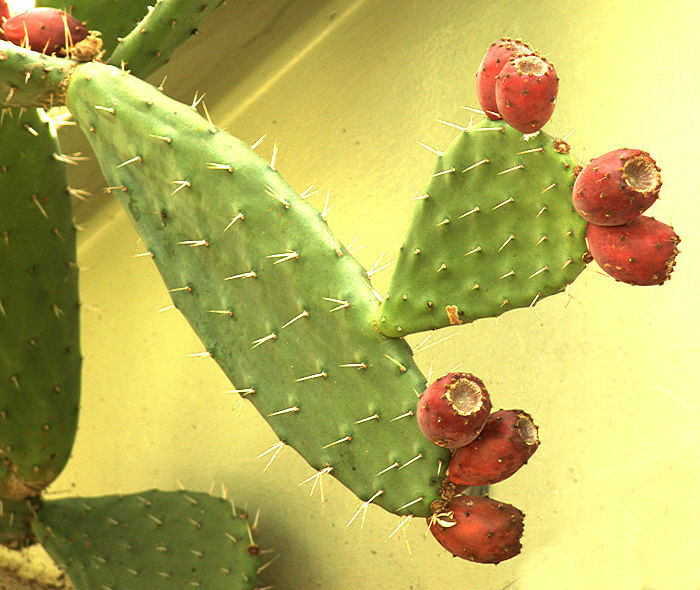 Fruits are dehiscent with a single slit, containing many kidney-shaped seeds and red pulp compacted together. Native to Argentina, Bolivia, Chile, and Peru. Uncommon in cultivation. 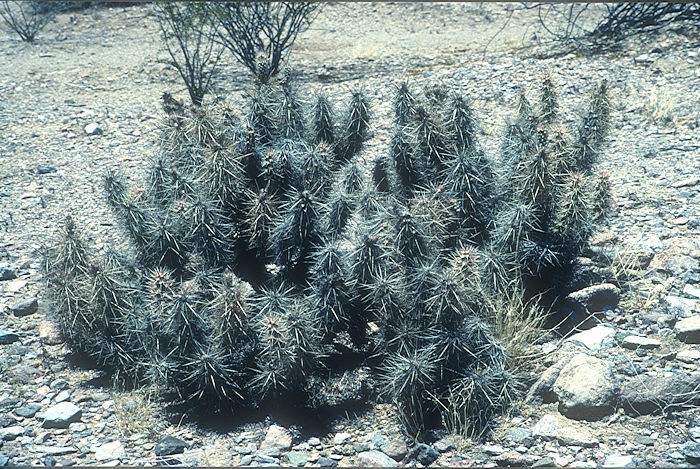 A mat-forming cactus with ovate, flattened segments to the jointed stems. Flowers are reddish with a green stigma. Labelled as O. microsphaericus but that doesn't seem to be a valid name. Might be a Tunilla sp.